Will you be looking up tonight? It's the night of the full moon. Historically, the Native Americans who lived in what is now the northern and eastern United States kept track of the seasons by giving distinctive names to the recurring full Moons. Each full Moon name was applied to the entire lunar month in which it occurred. These names, and some variations, were used by the Algonquin tribes from New England to Lake Superior. 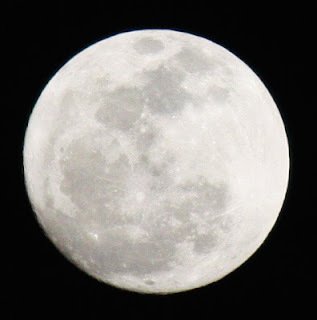 February's full moon's name is; Full Snow Moon. Usually the heaviest snows fall in February. Hunting becomes very difficult, and hence to some Native American tribes this was known as the Hunger Moon. An american yankee up past the 49th parellel.